Hello and welcome to the Fort Bend County Website. My name is Grayson Bliss. I am deaf and I use ASL (American Sign Language) for communication. As a former resident and student at Dulles High School, I am proud to tell you that Fort Bend County, in conjunction with Region 6 South of the Department of State Health Services, is making important health and preparedness information accessible to you in video ASL, in case of natural disasters, such as a hurricane or flooding. 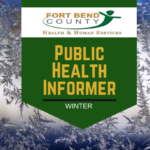 I am thrilled that Fort Bend is taking this major step in providing all of its citizens with access to important information. As you search this website, simply click on the Deaflink logo to watch the videos. In addition, these videos are voiced for those that are visually impaired. Please take the time to view this information then share with others how to access this site.